The project team is working to incorporate community input and comments that were submitted into the final plan. 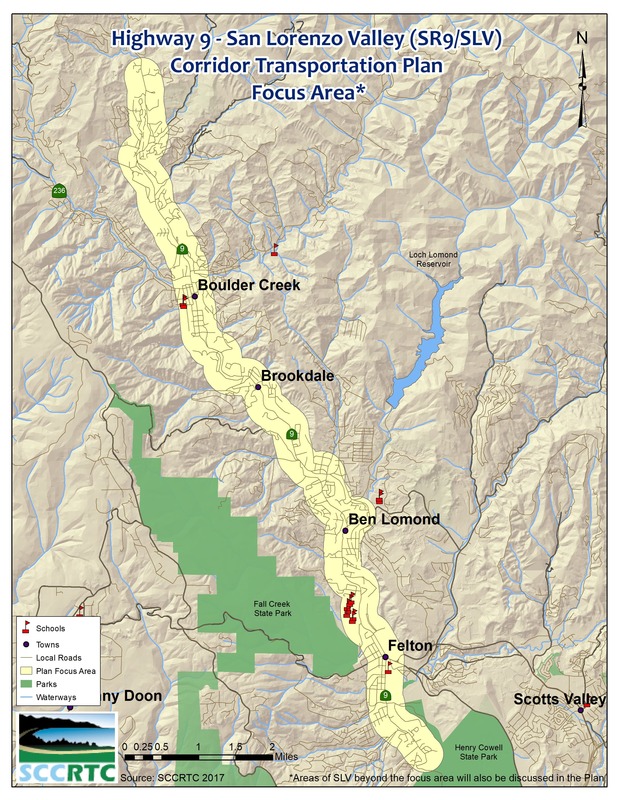 This transportation planning effort focuses on the section of Highway 9 that connects the towns of Felton, Ben Lomond, Brookdale, and Boulder Creek and parallel and connecting streets, roadways, and paths. Areas beyond the focus area are also considered in the plan, but not the focus of the plan. Prioritize transportation projects that can be implemented in the short and mid-term to address transportation challenges on the corridor. Measure D, which was approved by voters in November 2016, includes $10 million specifically earmarked for high priority transportation projects along the Highway 9 corridor. This corridor-specific plan will be a stepping stone to securing funding for priority investments and provide a framework for partnering with Caltrans to implement investments that promote complete streets, implement sustainable communities strategies, and improve multi-modal access, connectivity, safety, security, system preservation, economic vitality and environmental quality. The plan includes conceptual complete street designs and will be used to facilitate subsequent design, environmental review and construction of improvements. 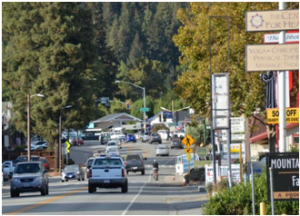 The Draft Highway 9/San Lorenzo Valley Complete Streets Corridor Plan is available below. Comments on the draft plan were due February 15, 2019. The project team is working to incorporate community input and comments into the final document. Written comments were due February 15, 2019 on the Draft Highway 9/SLV Plan. Community members are encouraged to stay involved in this project and sign up to receive periodic updates on the plan here: https://sccrtc.org/about/esubscriptions/, by emailing info@sccrtc.org, or by calling 831-460-3200. To report maintenance or other issues on county roads – contact County Public Works: http://dpw.co.santa-cruz.ca.us/ReportProblem.aspx or submit a request using Santa Cruz County’s free mobile app Citizen Connect. Building upon past public outreach efforts, the project team gathered input from hundreds of San Lorenzo Valley residents, businesses, community groups, parents and school administrators throughout development of the draft plan at open houses and over a dozen meetings, as well as surveys focused on this plan. Input provided on the draft plan will be used to finalize the plan. 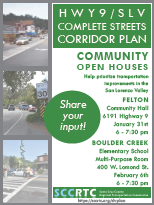 Community open houses: Jan 31, 2019 in Felton and Feb 6 in Boulder Creek on the Draft Hwy 9 / SLV Plan; May 31, 2017 in Felton on the Phase 1 report; and October 11, 2016 at the SLV Performing Arts Complex at SLV High School. Public Hearing on the Draft Plan at the Feb 7, 2019 RTC meeting. Surveys: hundreds of community members helped identify transportation challenge areas and provided input on priorities and what types of projects might make sense for improving transportation in San Lorenzo Valley (SLV). The Santa Cruz County Regional Transportation Commission (SCCRTC) is the lead agency preparing this plan, in partnership with Caltrans, the County of Santa Cruz, Santa Cruz Metropolitan Transit District (METRO), residents, businesses, schools, and other stakeholders, and the consultant team of Kimley-Horn and TrailPeople. 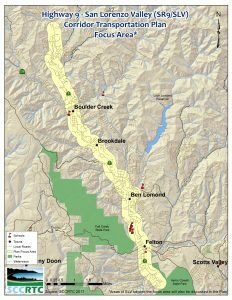 This planning effort is funded through a Caltrans Sustainable Communities Transportation Planning Grant (FTA 5304), Measure D and other local funds.